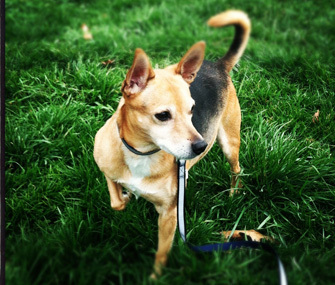 Rylie the 8-year-old mixed breed rescue visits the park up the street from his home, where he loves to run. Here are five (of many) reasons we think shelter dogs are the best dogs. 1. You can fall in love with them at first sight. We've heard the tale many a time: You know you're ready to adopt a dog. You've reconciled your work schedule to be able to come home at lunch and let him out for a quick play session. You've crunched the numbers and know you can pay for food, vet care and probably more tennis balls than a shelter dog ever chased in his life. And yet, you spend night after night browsing Petfinder, clicking through adorable photos and reading profiles. None of the matches feels perfect — until you see that one photo and you fall in love instantly. Like, Yep, that's my dog. 2. You can get full details about their personalities. 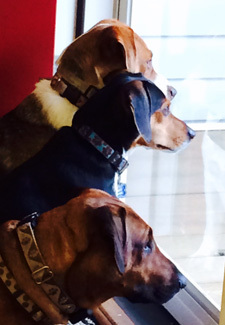 Wilson, Ziggy and Jitterbug are all rescues who live together in Gainesville, Georgia. Adopting a shelter dog is like meeting your significant other through the world's most reliable dating service: Shelter workers, volunteers and foster families have already checked out your potential puppy soul mate for you. No more blind date jitters. Gosh, I hope he gets along with children. Does she like outdoor activities? Will he judge me for the inexplicable amount of trashy reality television on my DVR? With a shelter dog, you can know ahead of time that he's great with kids, loves hiking and prefers Real Housewives of Atlanta (but he'll watch New Jersey if you really want to). 3. Many of them are already house-trained. Some of us really dread the messy, stressful, wake-up-every-three-hours phase of potty training a puppy. Buying pet stain cleaner in bulk? No, thank you. Many adult and senior dogs are already housebroken — and some are even trained in useful commands and tricks. We can't possibly oversell how valuable this is for a new pet owner.